A no-nonsense instrument that provides powerful but quiet operation with a host of sensible upgrades on a well-loved theme. Excellent tones and value for money. Neck feels great. Fret-King is one of those rare brands that champions honest-to-goodness pros, out on the road just getting on with it. While it's great to have a few superstars on your books, often it's the busy pro player that lugs gear up and down the country, putting it through its paces in pubs, clubs, recording studios and at festivals, who really shows if equipment can cut it or not. John Verity is one such six-stringer, at a point in his career where he knows what works for him and what doesn't. A Fret-King player already, Verity jumped at the offer of a signature guitar. His needs, are simple: John requires the best single-coil axe he can find. "When Trev and I first met I was using a US-made Classic with noiseless pickups. Trev asked me if I was happy with it and I said pretty much so, but it lacked a little bite and presence, plus I found the maple fingerboard a bit sticky. "We agreed to get together and talk about my 'ideal guitar', but by the time we did, I had gravitated back to three single coils; I just wanted the bridge pickup to have a bit more spank and for the guitar to be a little less prone to hum, especially in the studio." "Buried beneath the pickguard is the 'Power-coil' - a dummy pickup wired with the others in humbucking mode"
Wilkinson's solution was ingenious and elegant. Buried beneath the pickguard is the 'Power-coil'. This is a dummy pickup wired with the others in humbucking mode. "The dummy coil thickens up the sound while retaining the classic single-coil sweetness," says Verity. "And it cured the hum at the same time." We'll check out the sound for ourselves later on. With its centre-jointed American alder body marginally more offset in outline than its obvious inspiration, a wavy edged pickguard that complements a batwing headstock, plus a maple neck with 22-fret maple fingerboard, there are just enough stylistic tweaks to distance the Corona from... well, Corona. The JV's neck is unstained maple, while subtle gold fittings complete the look. "I've always been a sucker for Two-Colour Sunburst - blame those early Buddy Holly pictures," grins Verity, "and it looks great with the parchment scratchplate and gold hardware - not too much bling." We agree! One great advantage of a Wilkinson-designed guitar is the customary inclusion of Wilkinson-designed hardware. So, it's no surprise to find a WPV steel-saddled, two-point floating vibrato and his laughably simple but incredibly good E-Z-Lok tuners. "I'm not a trem divebomber, but I hit the bar from time to time," says Verity. "And I have no tuning problems despite having a pretty aggressive hand." Light in weight and comfortable to hold, one thing you instantly notice is that the JV feels nothing like a Fender. 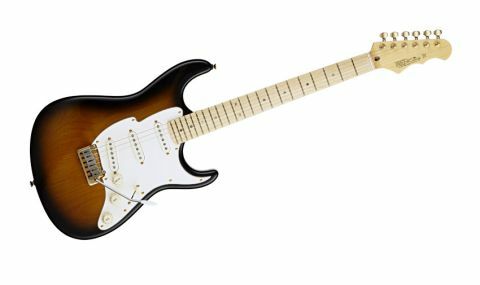 This reviewer fondly recalls late 70s bolt-on-neck Gibson Marauders and S-1s, and the JV is more redolent of those than a Strat. Those Gibbo necks were great, too! The satin finish is glitch-free and the neck sits wonderfully in the hand, while well-dressed frets and a flattish 'board leave bending and vibrato unimpeded. A rounded heel prevents the usually obtrusive corner from digging into the palm and scotching top-fret excursions, and the slightly exaggerated cutaways add to this sense of freedom. Wilkinson addressed Verity's request for a spanky-toned guitar with gusto. Dummy coils are not new - Fender employed them back in the 80s with its Elite Strat - but here, it works brilliantly. "There's a super 'in your face' quality, but plenty of low-end clout, too"
Overall, there's a feeling of both girth and presence to the expected three-single-coil, five-way selector array of tones. They don't exactly sound active, like EMGs, but there's definite sparkle and 'immediacy' to the tone that's perhaps more akin to John Suhr's hum-cancelling backplate idea, which we've also tried and liked. All this provides a super 'in your face' quality, but there's plenty of low-end clout, too, aided by the Power-coil's humbucking boost effect. We can see exactly why a studio player such as Verity would like it so much. John Verity's Corona JV is a classy toned vintage-style six-string that seems to have a little more of everything - it's as though Wilkinson has discovered an extra gear on a favourite classic car. Verity certainly agrees: "Since I got the first production model it's become my main guitar, just as it came in the box. It's nicely played in now after a few months' steady gigging and, of course, it gets better, as all nice guitars do."